Most of the web analysts today get the following view of display advertising from their Web Analytics tool. Looking at this data and some publicly available information they will get started on the analysis and recommendation. Though some other analysts will say, Wait… I need more information. Google Adwords has done such a great job in providing cost data and almost all of the analysts have dealt with some kind of paid search campaign, so they know that cost of campaign plays a role in the analysis of campaign. So they demand it. Well this is where most of the web analytics tools fell short, cost data generally resides in some other tool and it is not easy to get that data. But how said that Analytics was easy. However, I am providing full data with cost so that we can continue with this post. Keep in mind that many analysts will continue without cost data. If you are one of them then stop and look for the campaign cost data. Now the above view sort of mirrors what you are used to seeing in Google Adwords. So what do you think? Can we analyze this data and take some actions? This is what many web analysts end up doing. Some will be brave enough to venture into segmenting by repeat v/s new visitors, mobile v/s non-mobile etc. If you are doing some kind of segmentation then you are already moving in the right direction. However there is more…. I will write about that in my next part. Meanwhile, let me hear from you. What do you think? Where should we focus? Is everything looking good? If not then, what is wrong with this campaign? What is your recommendation? Are you obsessing over the total number of mentions, number of positive mentions and negative mentions? If you are then you are not alone. This same issue came up recently while I was speaking on the subject of Social Media at a local event. One person got very concerned when I said that a lot of social media conversations are marked “Neutral” in most of the social media monitoring tools. The reason is that tools are not yet advanced enough to classify everything and so when in doubt the conversation is marked “Neutral” rather than “Positive” or “Negative” . So what do you do in this situation, when you know that the sentiment numbers are not right? Short answer is: Don’t obsess over the raw counts. Tools - The number of mentions will change with the tool you are using. Different tools have different sources of data and different way of classifying spam, and hence the numbers won’t match between various tools. In other words you will never know exactly how many mentioned about your brand, products etc. are happening in Social Media. Tool Setup – The way you setup your tool will result in different count of conversations. Keywords - A generic keyword like “Windows” will bring many more results than “Microsoft Windows” however “MS Windows” will bring a different count and so on. The mention count will change depending on your keywords. Tool Updates – Tools are changing every day. The count of mentions and sentiment change as tools roll out updates to their algorithm. As for the sentiment, tools are changing the way they assign sentiment to the posts, so if last month something was classified as “Neutral”, similar post this month might be classified as Positive, due to changing algorithm as tools become better each day. Sentiment indicator allows you to see if you making an improvement in positive direction or not. Though it is still dependent on actual count, the impact is minimized or neutralized as tools become better in classifying both positive and negative mentions. Also, keep in mind that there is a lot more value in the actual conversations than just the counts. Finding value in actual text of the conversation requires manual scanning of the social media conversations. In these conversations is where you will find valuable information to help you optimize your marketing, products, PR etc. I am sure you have heard of a story about a guy lost his ring in a dark alley. It was really dark and he could not see anything, so he went to a nearby lamppost and started searching for his ring underneath it. When asked why he was looking for ring under the lamppost, he said “because it is bright here”. That’s what most of the web analyst do. 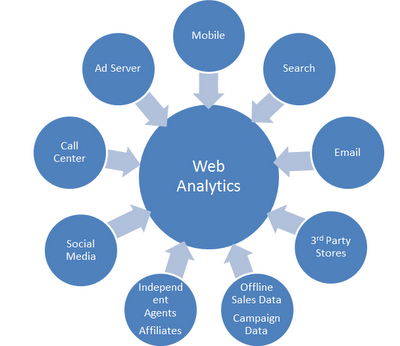 Even when the problem might exist somewhere other than what their web analytics data can show majority of the web analytics folks just look at “Web Data” for the answers. Why? Because that’s all the data they have easy access too. It is brighter there. Ad Server – There are several factors that impact a performance of a campaign, many of them don’t show up in your web analytics tools, they reside within ad servers or with 3rd parties. Example: Which pages the ads was shown, what time was the ad shown etc. I will write more on this in a future post. Conversions – Conversions can happen offline in-stores or via phone. Most of the time these won’t show up in your web analytics tool. 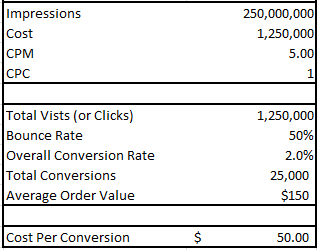 I wrote about this in my post Are you Optimizing the Wrong Steps of the Conversion Process? Social Media Conversations – Conversations about your brand, products, offers happen outside your domain and impact how people react to your campaigns, engage with your site and ultimately impact the conversions and bottom line. Many companies have started to collect the conversation data but they might sit within a different system owned by a different department. Mobile – Mobile usage is growing every day. More users spend their time on Mobile. If you don’t have an integrated view of the mobile data with other data sources then you will end up barking the wrong tree. Third Parties– Some companies do not sell any products on their site. Their sites are mainly there to provide information. They sell their products via 3rd parties. However these 3rd party sites also provide information on products, provide reviews, have user communities etc. You don’t need to visit the official company site to make a decision to purchase something. For example, you might never visit Samsung’s site to buy a Samsung TV. All the research you need is already available on Amazon or Best Buy. Similarly, many insurance providers sell their insurance through 3rd party agents. Game companies sell their games via 3rd parties. What does web analytics data show in this case? What you need is integrated data sources that provide you data other than just web analytics. I am not saying that it is going to be an easy task to get all this data but at least start thinking about those and see how you can bring them all together. 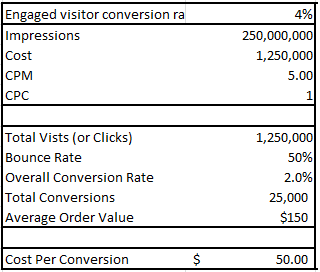 The purpose of this post is to clarify the terms CPM and CPC and also show how to convert from one model to the other. CPM stands for Cost per 1000 Impressions (number of times the ad is shown) (M is Roman numeral for 1000). Generally display advertising (e.g. banners) is sold in CPM. If the ad is shown 1000 times the cost will be equal to 1 CPM price. For example, if a publisher charges $10 CPM, that means your ad will be shown 1000 times for $10. If your budget is say $10,000 then mean your ad will be shown 1,000,000 times ($10,000 *(1000/$10) ). If you notice in the above calculations, there are no mentions of how many people the ad will be shown to or how many clicks will be generated. CPM advertising is solely based on impressions. In theory if you don’t set a frequency cap (i.e. the maximum number of times one person will see your ad) then you could end up serving all the impression to one person only. (If you would like to know more about frequency cap then drop me a line and we can talk further). CPC stands for Cost Per Click. Google Adwords made this model popular. Generally search and text advertising is sold by CPC model. In this kind of advertising model you just pay for number of clicks you get on your ads irrespective of number of impressions it takes to generate those clicks. For example, if the CPC is $1.00 and your ad is shown 12,000 times but gets no clicks then you pay nothing. If you get 10 clicks on your ad then you pay $1.00X10 = $10.00. The goal of advertising using one model versus the other is really dependent on what you are trying to achieve. If your objective is to generate Brand awareness then you might engage in display advertising which will most likely be sold in CPM model. While search ads on Google or text or display advertising on Google Ad Network are sold in CPC model. Often you will end up comparing two models to figure out where and how to spend your money effectively. 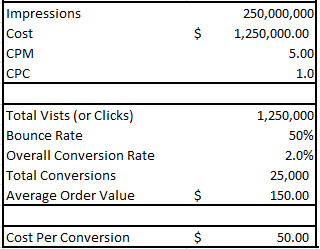 To do direct cost comparison you will need to convert CPM to CPC or CPC to CPM pricing. Below is a spreadsheet to show you the same calculation. Let’s take an example of a campaign that costs you $10 CPM and generates 50 clicks in 50,000 impressions. The above $10 CPM campaign is equivalent to a $5 CPC campaign. Let’s take an example of a campaign that costs $4 per click and generates 100 clicks, resulting in a total spend of $400. Let’s say it took 50,000 impressions to generate those 100 clicks. The CPM value you get when you convert CPC into CPM is also known as eCPM (effective CPM). I have developed few calculators to calculate CPM and CPC, feel free to use them.